Another photo from pixabay brings the inspiration for today’s painting. This one reminded me so much of Maria from Sound of Music on her way to care for the children. 🙂 Lovely story. Posted on June 8, 2017 by Jaana Day. 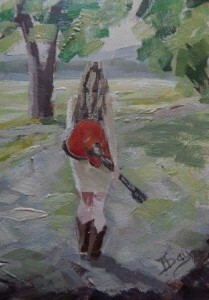 This entry was posted in Landscape and tagged Art, brown, brush strokes, Genesis Heat Set Oils, girl, green, guitar, gum trees, impressionism, impressionist, Inspired, landscape, Oils, Painting, road, stroll, sunlit, walking, woman. Bookmark the permalink.